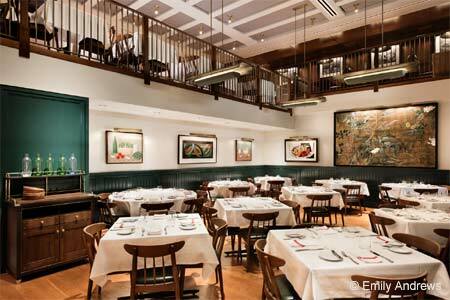 The new incarnation of Danny Meyer's first restaurant, serving elegant, seasonal dishes. : Almost exactly a year after the three-decades-old original Union Square Cafe closed on East 16th Street, the new and improved version of Danny Meyer’s beloved first restaurant is open on 19th and Park. The space is bigger and carefully designed to reflect the restaurant’s ethos of hospitality and service. The long, mahogany bar on the main floor fills up fast. There’s a second bar up the sweeping staircase, made from the same bar top that graced the other place, and clusters of comfortable tables and booths overlooking the buzzing main floor. The expanded bar area means a more creative, substantial cocktail program --- a bitter almond Negroni with Grappa alla Mandorla, Cocchi Rosa and a blend of bitters hits the spot. The wine list is still topnotch. 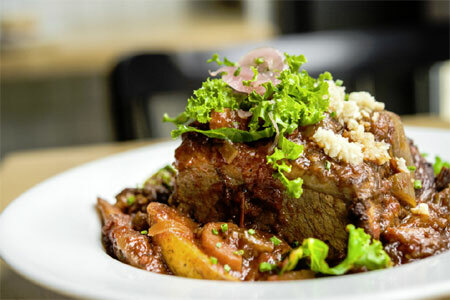 The menu is updated but remains true to its previous focus: seasonal, farm-to-table food prepared gracefully and simply. A few favorites are here, like the pillowy ricotta gnocchi and a refreshing salad of Bibb and red oak lettuces, zippy with shards of Gruyère and a Dijon vinaigrette. Chicken is crispy-skinned and juicy; a lamb shank with roasted potatoes and salsa verde falls suitably off the bone. Don’t miss the espresso chocolate cake, assembled with layers of espresso ganache and goat’s milk caramel. It’s served with a cold glass of Battenkill milk, as all chocolate desserts should be.